Koenig designed for the Case Study Program two villas. It designed in 1959, takes advantage of the remarkably specific site that was imposed. The land is 150 feet by 86 feet, it is situated on the edge of a cliff overlooking the city of Los Angeles. Only two metal beam sizes are used for home, I-beams 12 inches (about 30 cm), and H columns of 4 inches (about 10 cm). This structure is disposed on a structural frame of 20 feet (6 m). – The roof is composed of T 5 inches which allows it to withstand 20-foot beam and between the false doors 7 feet. The project consists of a grid of 10 x 10 feet. 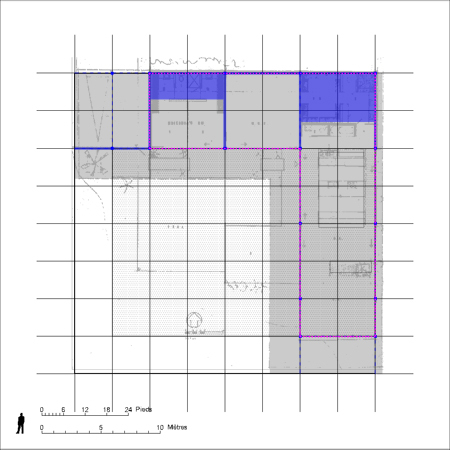 The entire project is in a square of side 80 feet (about 24.5 meters). 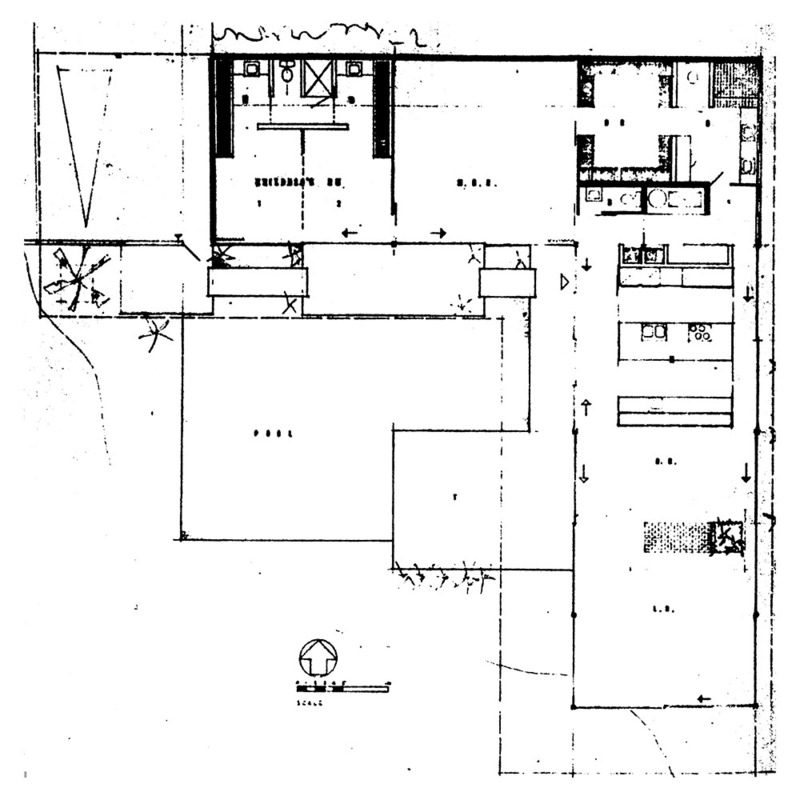 The house has a uniform thickness of 20 feet corresponding to the structural frame of the building and regular. The house backs onto an opaque barrier. This continuous opacity and unique barrier insulates the house from the street. This barrier actually forms the boundary between inside and outside the home. Thus, it returns some areas to the outside as the porch. 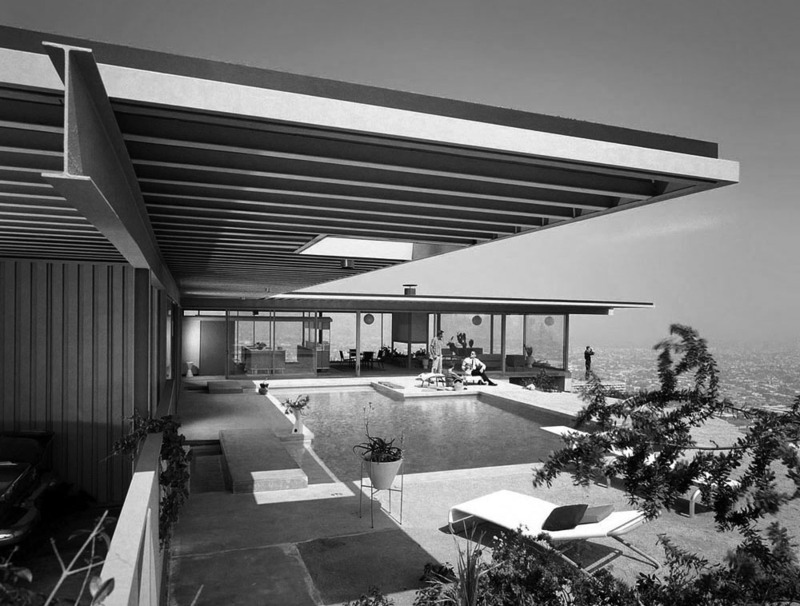 Therefore, the real entry into the house is paradoxically when leaving the covered area of the « car-port », we cross the wall to be on the terrace by the pool. The spaces of closed life gathered in the east of this area. The boundary between inside and outside is as unobtrusive as possible. Completely transparent, with no opacity, it is treated by very large windows. The pace of these berries is completely based on that structure. 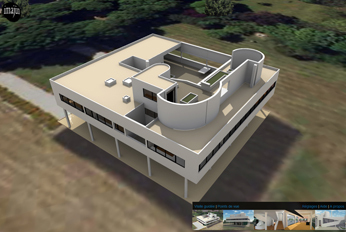 This scheme allows to understand the peculiar way in which Koenig discusses the living spaces in this Case Study House. Basically the opacity of the wing, the rooms occupied by enabling lean back home and to separate it from the street. Seen here in the foreground, the continuity of the common areas, rhythmic very broadly by the metal structure. This continuity is enhanced by the very high presence of the roof and the soil composition. Roofing: it is completely overwhelming. By cantilever effects, it stretches completely the space. She totally blurs the boundary between reading the exterior and interior spaces. This soil decomposition is underlined by the presence and treatment of the pool. This game between the floor and roof finishes to give the space character « suspended ». The only border that seems clear is that which separates the villa from the street. Any other limits whether vertical or horizontal fragment seem to completely disappear completely. Thus the interior of the villa seems to fly completely between heaven and earth.